Coconuts make up staples in many cuisines -- including several Indian and South American cuisines -- and their widespread availability in the tropics provided sustenance needed to establish trade routes, according to Dr. Kenneth Olson, an associate professor at Washington University. Desiccated coconut, made by shredding dried coconut meat, helps infuse tropical flavor into your meals. It also offers nutritional value that supports tissue health. Desiccated coconut provides minerals you need to keep your connective tissues -- a group of tissues that includes your skin, tendons, ligaments, bones and teeth -- strong. Connective tissue contains large amounts of collagen, tough and resilient protein fibers that form networks and hold your tissue together. Both copper and manganese support healthy collagen production, so they keep your tissues strong. An ounce of desiccated coconut offers 778 micrograms of manganese -- 43 percent of the recommended daily intake for women and 34 percent for men -- as well as 226 micrograms of copper, or one-quarter of your recommended daily copper intake. The copper in desiccated coconut also maintains the health of your brain. It activates enzymes responsible for the production of neurotransmitters -- chemicals your brain cells use to relay information. Other copper-dependent enzymes help you produce myelin, the fatty coating that sheaths each nerve cell and helps the cell conduct electricity. The fat found in desiccated coconut might also prevent neurological disorders. One study, published in the "Journal of Alzheimer's Disease" in October 2013, found that the oil in coconut helps shield nerve cells from the toxic effects of protein plaques, which would otherwise drive Alzheimer's disease progression. Desiccated coconut offers other health benefits thanks to its iron and fiber content. Your body uses fiber to control your blood cholesterol levels, and a diet rich in fiber fights type-2 diabetes and cardiovascular disease. Desiccated coconut offers 4.6 grams of fiber per ounce, which is 18 percent of the recommended daily intake for women and 12 percent for men. The iron found in coconut helps you make ATP -- a source of energy -- as well as red blood cells that you need for oxygen transport. An ounce of desiccated coconut offers 0.94 milligrams of iron -- 12 percent and 5 percent of the daily iron intakes recommended for men and women, respectively. Despite the nut's impressive nutrient content, you should consume desiccated coconut in moderation because it's high in saturated fat. Each serving contains 18.3 grams of total fat, including 16.2 grams of saturated fat. 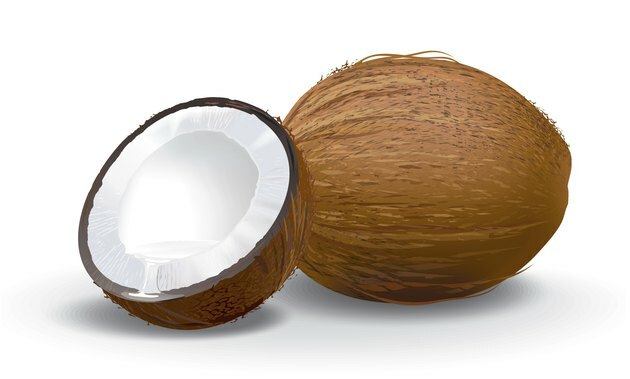 This means that just one ounce of coconut contains just shy of three-quarters of your daily saturated fat limit, if you follow a 2,000-calorie diet. Dr. Walter Willett writes in Harvard Health Publications that while coconuts' fat content might not be as harmful as saturated fat from other sources, you should still limit your intake.